The role intrinsic statistical fluctuations play in creating avalanches – patterns of complex bursting activity with scale-free properties – is examined in leaky Markovian networks. Using this broad class of models, we develop a probabilistic approach that employs a potential energy landscape perspective coupled with a macroscopic description based on statistical thermodynamics. We identify six important thermodynamic quantities essential for characterizing system behavior as a function of network size: the internal potential energy, entropy, free potential energy, internal pressure, pressure, and bulk modulus. In agreement with classical phase transitions, these quantities evolve smoothly as a function of the network size until a critical value is reached. At that value, a discontinuity in pressure is observed that leads to a spike in the bulk modulus demarcating loss of thermodynamic robustness. We attribute this novel result to a reallocation of the ground states (global minima) of the system's stationary potential energy landscape caused by a noise-induced deformation of its topographic surface. Further analysis demonstrates that appreciable levels of intrinsic noise can cause avalanching, a complex mode of operation that dominates system dynamics at near-critical or subcritical network sizes. Illustrative examples are provided using an epidemiological model of bacterial infection, where avalanching has not been characterized before, and a previously studied model of computational neuroscience, where avalanching was erroneously attributed to specific neural architectures. The general methods developed here can be used to study the emergence of avalanching (and other complex phenomena) in many biological, physical and man-made interaction networks. Networks of noisy interacting components arise in diverse scientific disciplines. Here, we develop a mathematical framework to study the underlying causes of a bursting phenomenon in network activity known as avalanching. As prototypical examples, we study a model of disease spreading in a population of individuals and a model of brain activity in a neural network. Although avalanching is well-documented in neural networks, thought to be crucial for learning, information processing, and memory, it has not been studied before in disease spreading. We employ tools originally used to analyze thermodynamic systems to argue that randomness in the actions of individual network components plays a fundamental role in avalanche formation. We show that avalanching is a spontaneous behavior, brought about by a phenomenon reminiscent to a phase transition in statistical mechanics, caused by increasing randomness as the network size decreases. Our work demonstrates that a previously suggested balanced feed-forward network structure is not necessary for neuronal avalanching. Instead, we attribute avalanching to a reallocation of the global minima of the network's stationary potential energy landscape, caused by a noise-induced deformation of its topographic surface. Networks of living neurons exhibit diverse patterns of activity, including oscillations, synchrony, and waves. Recent work in physics has shown yet another mode of activity in systems composed of many nonlinear units interacting locally. For example, avalanches, earthquakes, and forest fires all propagate in systems organized into a critical state in which event sizes show no characteristic scale and are described by power laws. We hypothesized that a similar mode of activity with complex emergent properties could exist in networks of cortical neurons. We investigated this issue in mature organotypic cultures and acute slices of rat cortex by recording spontaneous local field potentials continuously using a 60 channel multielectrode array. Here, we show that propagation of spontaneous activity in cortical networks is described by equations that govern avalanches. As predicted by theory for a critical branching process, the propagation obeys a power law with an exponent of -3/2 for event sizes, with a branching parameter close to the critical value of 1. Simulations show that a branching parameter at this value optimizes information transmission in feedforward networks, while preventing runaway network excitation. Our findings suggest that "neuronal avalanches" may be a generic property of cortical networks, and represent a mode of activity that differs profoundly from oscillatory, synchronized, or wave-like network states. In the critical state, the network may satisfy the competing demands of information transmission and network stability. 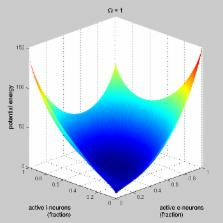 Spontaneous cortical activity in awake monkeys composed of neuronal avalanches. Spontaneous neuronal activity is an important property of the cerebral cortex but its spatiotemporal organization and dynamical framework remain poorly understood. Studies in reduced systems--tissue cultures, acute slices, and anesthetized rats--show that spontaneous activity forms characteristic clusters in space and time, called neuronal avalanches. Modeling studies suggest that networks with this property are poised at a critical state that optimizes input processing, information storage, and transfer, but the relevance of avalanches for fully functional cerebral systems has been controversial. Here we show that ongoing cortical synchronization in awake rhesus monkeys carries the signature of neuronal avalanches. Negative LFP deflections (nLFPs) correlate with neuronal spiking and increase in amplitude with increases in local population spike rate and synchrony. These nLFPs form neuronal avalanches that are scale-invariant in space and time and with respect to the threshold of nLFP detection. This dimension, threshold invariance, describes a fractal organization: smaller nLFPs are embedded in clusters of larger ones without destroying the spatial and temporal scale-invariance of the dynamics. These findings suggest an organization of ongoing cortical synchronization that is scale-invariant in its three fundamental dimensions--time, space, and local neuronal group size. Such scale-invariance has ontogenetic and phylogenetic implications because it allows large increases in network capacity without a fundamental reorganization of the system. Conceived and designed the experiments: GJ. Performed the experiments: GJ. Analyzed the data: GJ JG. Contributed reagents/materials/analysis tools: GJ JG. Wrote the paper: GJ JG. This material is based upon work supported by the National Science Foundation ( http://www.nsf.gov) under Grant Number CCF-1217213. The funders had no role in study design, data collection and analysis, decision to publish, or preparation of the manuscript. Any opinions, findings, and conclusions or recommendations expressed in this material are those of the authors and do not necessarily reflect the views of the National Science Foundation. Do Neural Avalanches Indicate Criticality After All?